This report describes how the international association meetings market's exponential growth is closely related to global progress in science, technology and society. 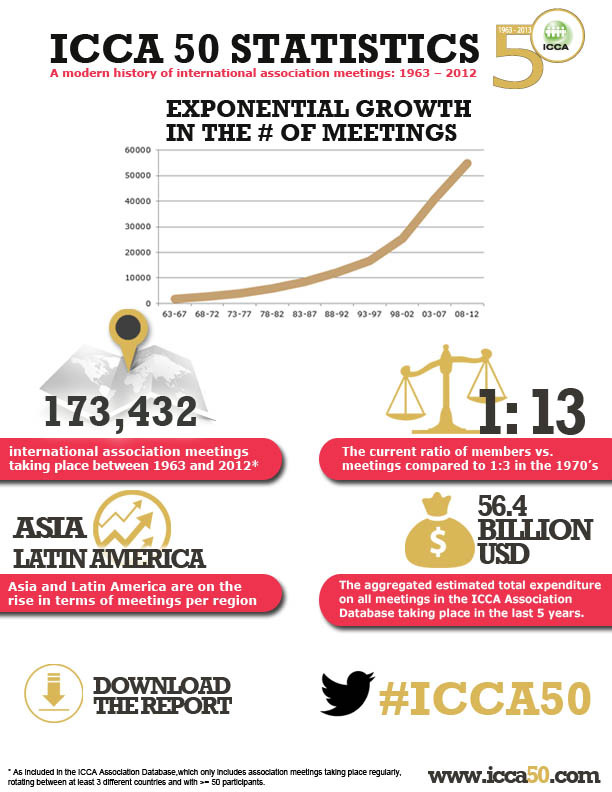 ICCA conducted a study of 50 years of association meetings data as the centrepiece of its new publication, “A modern history of international association meetings”, launched as part of ICCA’s 50th anniversary year in September 2013. ICCA asked its members and friends to share their insights into both the past and the future of this sector, and agreed a policy to allow anyone to download and use it. ICCA plans to proactively promote it through every channel at its disposal, worldwide.Looking at aggregated figures for each five year period (to remove annual fluctuations), the number of regularly-occurring, internationally-rotating association meetings is increasing by 100 per cent every 10 years, and has been consistently doing so for the last half century, with no signs of a slowdown. It is no coincidence that there is a parallel between the exponential growth of the international association meetings sector and progress in the fields of science, healthcare and technology. Association congresses are to a large extent driven by advances in these fields, and the unprecedented levels of discovery and innovation that are the hallmarks of recent decades are giving birth to entirely new associations and conferences, which are in turn stimulating further advances, new business opportunities, and fresh insights. Association meetings are also important drivers of societal change and opportunities to address and understand some of the world’s most challenging problems. Expert thinkers are brought together from government, industry, NGOs and academia to share knowledge and to find solutions. ICCA includes a number of case studies in its report to illustrate how this process works, and to demonstrate that the value of international meetings extends far beyond the immediate economic impact of the delegates on their host destinations. “This is something that every association should be doing: showcasing and shouting about inventions, discoveries, advances, solutions, collaboration and new pathways for the future. All of these wonderful products of association activity are on show at your international meetings, and this is when the world is most ready to listen to well-crafted messages that illuminate your members’ achievements. Alone, this is a worthwhile enterprise for any association; together, if all of us join in to raise the volume exponentially, our similarly fast-expanding community will start to earn the recognition and respect it deserves!”, said Sirk. DOWNLOAD “A modern history of international association meetings” (PDF).